Going to take th Durango down tomorrow to the local track. What pinion would you recommend for a 13.5t with the standard v3 spur gear? New to all this...... I have a 34 that doesn't fit under the cover a 24, 22 and 19. The 34 on the Schumacher Cougar kr literally lifts the front wheels down the back straight it's that fast. The ready to race dex210 came with a 13.5 speed passion motor and run a 29 or 30 pinion frim memory with the standard spur gear. RW used to make spur gears for the dex210 if you want to go smaller. I am UK based and still have some spur gears 75 being the smallest. I have been told that Schumacher spurs are a direct replacement for team Durango Spurs. Don’t know the exact part numbers but I have one Schumacher 71 tooth spur and the slipper pad is same. I had trouble finding the same type of Schumacher spurs at A-Main. Says they are backordered, so don't know if they expect them back or not. 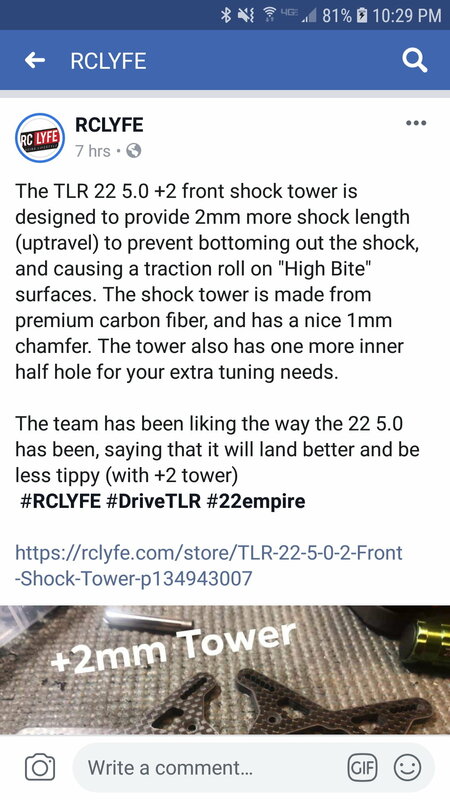 I was griping about needing more shock up travel on my 210 a few years ago. It's finally a mainstream mod on the 22 5.0.
funny thing was, when i talked to Trish, from Schumacher at an EOS race here in austria, two years ago, about the lack of up travel on my schumacher k2, his answer was simply, that you wont your car/shocks traveling that far down, that they can bottom out! from this time on, i never talked about set up, with the pros anymore. Last edited by micholix; 03-30-2019 at 01:03 AM. What drew me to the 210 in the first place way back when was the fact that it was the only car that could do MM3. I hated my X6^2 but liked it a lot more once I installed the original X6 3 gear. That case was horribly made though but I learned enough from it to know that MM4 sucked. This was back when there were still many running rear motor and those that were running mid motor swore that only MM4 worked well. Durango was way ahead of their time in many places but then missed obvious things in other areas. It was weird. I still have a original x6, with 3gear box sitting on my shelf too. it was nice too, to write with chris doughty about the TD cars.